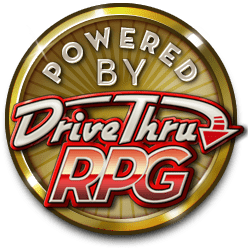 OneBookShelf is the parent company behind DriveThruRPG and RPGNow. We sponsored the creation of FirstFable and released in under Creative Commons both to give something back to the hobby that we love and also because we felt that there weren't enough roleplaying games truly engineered with younger kids in mind. After we started work on FirstFable, some other great games for kids have been released: titles like Hero Kids by Justin Halliday and Eric Quigley (a kids game that uses a tabletop map and minis approach which many kids may prefer over the theatre-of-the-mind approach used in FirstFable) and many more family-friendly titles. Why is the core book the only one not available for POD? I'm currently making "my own" rpg adventure for my niece and nephew (7 and 5) since they couldn't stop rolling my rpg dices. I made them short improvised stories making them roll D20, D8 or D4 and they loved this "rpg introduction" so much than I finally gave them a dice set each. I read firstfable and am reading herokid as well to take what I like best in both games, but what bugs me is that both games use only 6 sided dices... That's a shame, since most parents introduce rpg to their kids because they play themselves (so they must have dice sets, right ?). Having developed RPGs before, specifically ones using pools of D6s, I can tell you what's up with the D6s. Second, D6s just have really good numbers. 1 to 6 seems to be a sweet spot when it comes to randomized numbers, because numbers 6 and under are both small enough that they're easy to add and don't seem overwhelming when multiple dice are rolled, and yet they're large enough to feel meaningful when you get a new one, even when you have 5 or 6 of them in a roll. User Yamil G. gave this product 2 stars for no other reason than the fact that it has a section that advises the GM to avoid stereotypes, apparently offended that the game might be "a teaching for promoting PC garbage." (His only other review is for a product he rated one star because it *gasp* talked about the sexuality of a fantasy race.) The passage in particular that he quotes is, "...because many gamers are heterosexual, white, and male, it’s easy for us to miss how offensive those stereotypes are," and he goes on to ask, "Children are not offended by things like this because at that age they don't understand things involving the various subgroups of people to begin with. So who exactly does the author believe they'd be offending with these 'stereotypes'? What is the purpose and/or implication of the author bothering to insert such a thing into a game for kids. It's a game for kids right???" "Avoid Stereotypes: Movies and TV frequently give us stock characters. It’s very easy, unfortunately, to fall into some tropes and stereotypes that are downright offensive, and because many gamers are heterosexual, white, and male, it’s easy for us to miss how offensive those stereotypes are. Kids, likewise, probably don’t have the life experience to realize when the GU is playing a goblin thug with a 'gangsta' dialect and break down what exactly that means in terms of realworld race, but they will certainly take that experience with them. Don’t go for the easy laugh. Don’t make jokes at the expense of other ethnicities, races, or orientations. Don’t make the frail, girly damsel the one that characters have to save. Don’t take the easy way out. Instead, think about your Adventures and how you can build them to challenge these kinds of stereotypes, to surprise the players when things don’t turn out the way they might expect." It always disheartens me that so many people have this aversion to anything they perceive as remotely "PC" that they'll immediately rebel against things that are just common sense. Yamil even admits that "the game looks fine" aside from that passage. BTW, Yamil, I must advise you skip over page 121 of the new D&D 5e Player's Handbook. It might give you the vapors. Hey, I saw his comment and agreed with him. "...because many gamers are heterosexual, white, and male, it’s easy for us to miss how offensive those stereotypes are,"
The quote is saying that being heterosexual, white, and male are offensive stereotypes. Reading the full quote, I still don't like the assumption that a) I'm a white male , and b) because of this I would not know an offensive stereotype when I see it. But I do appreciate the sentiment of trying to protect kids from bad stereotypes and prevent them from letting that seep into the game. And I'm not happy with Yamil G.'s gross out-of-context quotation. Jesse: I do think that maybe cutting out the "...and because many gamers are heterosexual, white, and male..." portion of the sentence might have made it read a bit better. (They do seem to be lumping themselves in with the group of heterosexual, white males, for what it's worth.) After all, there are also harmful stereotypes of white cultures. But the suggestion, "Don’t make jokes at the expense of other ethnicities, races, or orientations," is a good one.